This paper proposes novel robot navigation methods that utilize strong interaction between a designed field and a robot controller. In recent years, several studies have demonstrated the importance of interactions between different subject types (e.g., human-robot interaction, robot-environment interaction) instead of just that between a robot controller and an isolated subject. This study explores the robot-field interaction design to realize autonomous robot navigation, and verifies the proposed methods experimentally. We prepare acoustic navigation trails from the start to the goal; one is generated from multiple sounds with identical frequencies, while the other is generated from multiple sounds with different frequencies. For each field controller, both the dynamic acoustic trail and the static acoustic trail, two types of static robot controllers are designed based only on the present sensor data, namely, gradient-following controller and sound-habituation controller. The former is a microphone-array based controller for robots equipped with multiple microphones, while the latter is designed for robots with a single microphone. Throughout the real-world demonstration, we show the validity of our proposed methods. 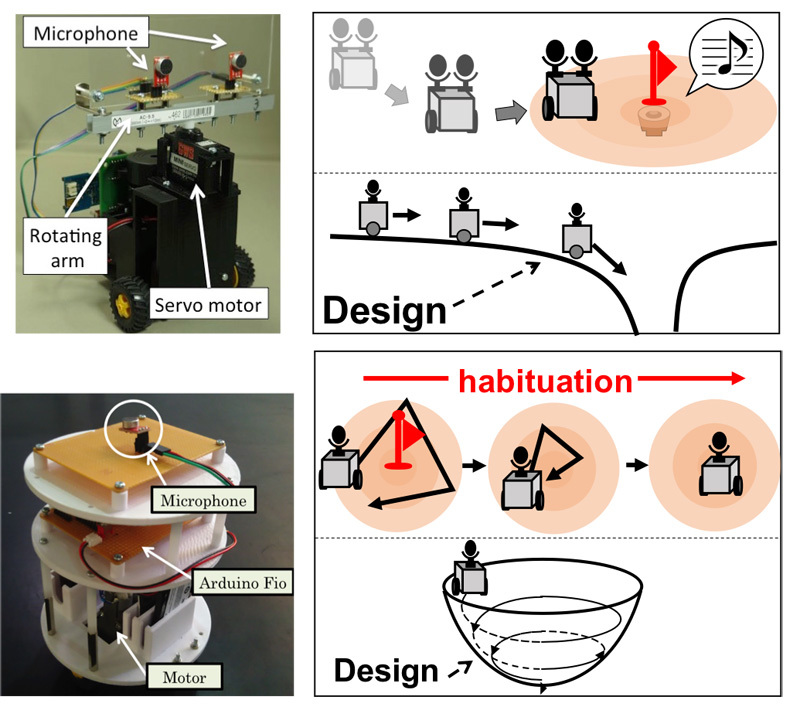 Y. Tsunoda, Y. Sueoka, and K. Osuka, “Experimental Analysis of Acoustic Field Control-Based Robot Navigation,” J. Robot. Mechatron., Vol.31, No.1, pp. 110-117, 2019. J. J. Leonard and H. F. Durrant-Whyte, “Directed sonar sensing for mobile robot navigation,” Vol.175, Springer Science & Business Media, 2012. O. Khatib, “Real-time obstacle avoidance for manipulators and mobile robots,” I. J. Cox and G. T. Wilfong (Eds. ), “Autonomous robot vehicles,” pp. 396-404, Springer, 1990. J.-O. Kim and P. K. Khosla, “Real-time obstacle avoidance using harmonic potential functions,” IEEE Trans. on Robotics and Automation, Vol.8, No.3, pp. 338-349, 1992. Y. Koren and J. Borenstein, “Potential field methods and their inherent limitations for mobile robot navigation,” Proc. 1991 IEEE Int. Conf. on Robotics and Automation, pp. 1398-1404, 1991. A. H. Purnamadjaja and R. A. Russell, “Guiding robots’ behaviors using pheromone communication,” Autonomous Robots, Vol.23, No.2, pp. 113-130, 2007. R. A. Russell, “Heat trails as short-lived navigational markers for mobile robots,” Proc. 1997 IEEE Int. Conf. on Robotics and Automation, Vol.4, pp. 3534-3539, 1997. J. Ferber, “Multi-agent systems: an introduction to distributed artificial intelligence,” Vol.1, Addison-Wesley Reading, 1999. R. Olfati-Saber, J. A. Fax, and R. M. Murray, “Consensus and cooperation in networked multi-agent systems,” Proc. of the IEEE, Vol.95, No.1, pp. 215-233, 2007. J. Fink, M. A. Hsieh, and V. Kumar, “Multi-robot manipulation via caging in environments with obstacles,” IEEE Int. Conf. on Robotics and Automation 2008 (ICRA 2008), pp. 1471-1476, 2008. M. Okada and T. Ando, “Optimization of personal distribution for evacuation guidance based on vector field,” J. of the Robotics Society of Japan, Vol.29, No.4, pp. 395-401, 2011. L. C. A. Pimenta, N. Michael, R. C. Mesquita, G. A. S. Pereira, and V. Kumar, “Control of swarms based on hydrodynamic models,” IEEE Int. Conf. on Robotics and Automation 2008 (ICRA 2008), pp. 1948-1953, 2008. R. Fujisawa, H. Imamura, T. Hashimoto, and F. Matsuno, “Communication using pheromone field for multiple robots,” IEEE/RSJ Int. Conf. on Intelligent Robots and Systems 2008 (IROS 2008), pp. 1391-1396, 2008. A. H. Purnamadjaja and R. A. Russell, “Pheromone communication in a robot swarm: necrophoric bee behaviour and its replication,” Robotica, Vol.23, No.6, pp. 731-742, 2005.